Myers and Chang - Cheap Date Night! The Improper Bostonian has a "Tasting" section towards the back with tips on special events at restaurants around Boston. I peruse it occasionally for ideas on new places to try out and I love coming across different deals to check out around the city. 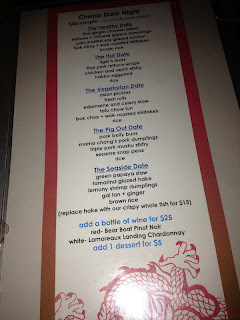 One I had my eyes on for a while was 'Cheap Date Night' at Myers + Chang, on Washington Street in the South End. Every Monday and Tuesday starting at 5:00pm, the restaurant offers special shareable menus for just $40/couple. The Chef, Joanne Chang, is the genius behind Flour Bakery, which I've always enjoyed, so I thought her and her husband's Asian restaurant just had to be good. We made a reservation to be safe, which the restaurant recommends, but I actually think we would've been okay getting a table for 4 without the reservation. We went around 7pm on a Monday night. They have 5 separate menus in different themes that you and your date can pick from! 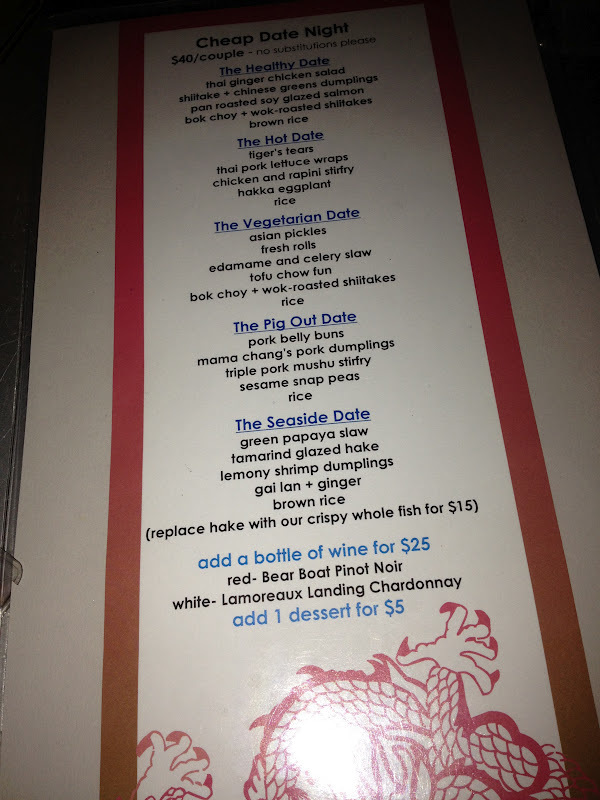 The options are The Healthy Date, The Hot Date, The Vegetarian Date, The Pig Out Date, and The Seaside Date. Some of the dishes were spicier than I anticipated - particularly the salad and salmon. I loved the bok choy and the dumplings were pretty good too. The amount of food was perfect - not a crazy amount but we certainly didn't leave hungry. Our friends decided to order their own dishes instead of choosing a pre-selected date night menu. Apparently their 'Mama Chang's Pork Dumplings' are one of the house specials, but we didn't get to try those this time. The Seaside Date also had some dishes that sounded tasty, but a few of them were marked as being spicy so that ruled the option out. They also have a Dim Sum Brunch I'm interested in checking out so that might have to be the next time I head to the area! It's just down the street from one of my other South End favorites - Teranga! With two friends visiting over Labor Day weekend I found out that one had never been to Maine before and one had only been once or twice before! I got planning and despite the bad weather, we spent part of the weekend driving up Route 1A along the coast, making stops in Ogunquit, Kennebunkport, Perkins Cove, York and no trip to Maine is complete without a stop at the Kittery Outlets! On the way home we knew we wanted to get some quality seafood so I set out on a yelp search for a good place near where we were. 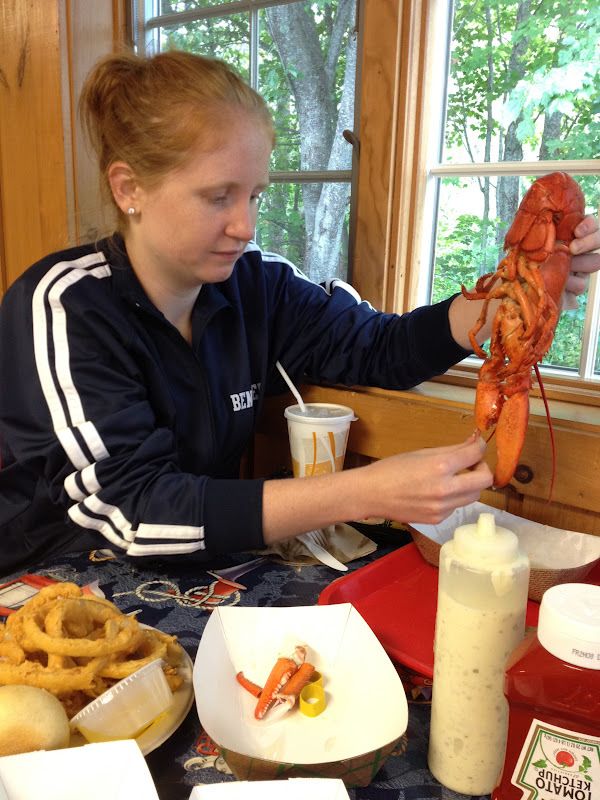 We ended up at the Seafood Center of Maine in Arundel, just a mile north of Kennebunk and were all pretty impressed with the food! 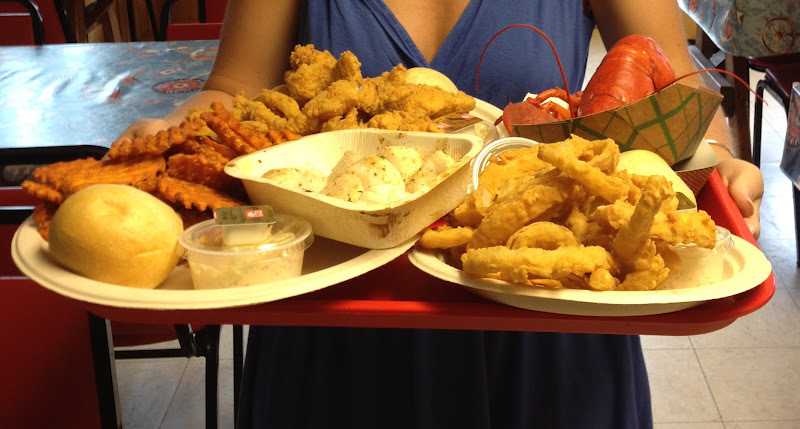 I had been craving some good fried seafood for a while - my family usually goes once a year to indulge in the heart-stopping food, but I missed out when they went earlier this summer. So I knew right away which part of the menu was calling my name! Even if you don't eat friend food though, they have lots of options - grilled, baked, sandwiches, chowders and more! The restaurant venue itself isn't anything special - we felt a bit like we were in someone's basement for a 15th birthday party (streamers hanging and everything!). 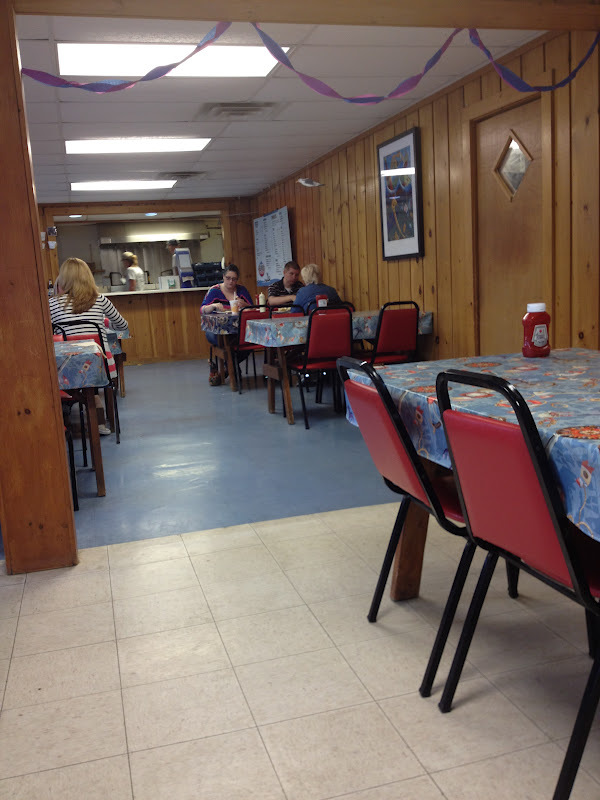 It's those places though that surprise me in the best way, with their delicious homemade, fresh food! Prices seemed fairly reasonable for fresh seafood - for example, my friend's freshly steamed lobster dinner complete with a 1 1/4 lb lobster, coleslaw and fries was $14.75. 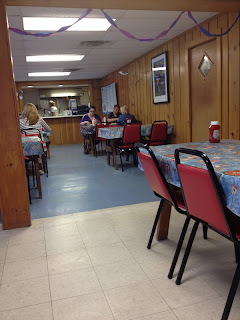 I opted for their famous fish fry, a fried white fish served with onion rings for just $7.95. My other friend went the healthier route and got the Baked Scallops with a side of waffle sweet potato fries ($13.90). If you're on Route 1 and in the Southern Maine area I'd definitely recommend this local spot! 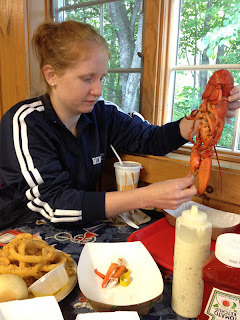 Nothing better than someone experiencing fresh Maine lobster for the first time, but I still prefer getting messy eating lobster in my own home! Inspired by my recent frittata recipe with kale and the fact that my friend had gotten kale at the grocery store - we found this recipe from Clean Eating Magazine and set out to cooking! I know it looks like a lot of ingredients, but don't let it scare you off - it's just the sauce that takes lots of ingredients! If you've ever cooked Asian food in your kitchen, it's likely you have all of these things already. Inspired by Clean Eating, we basically kept the recipe the same! 1. The first step is to cut and dry off the tofu. I usually cut it into my pieces and then place it between a double layer of paper towels, trying to squeeze out some of the liquid naturally in it. 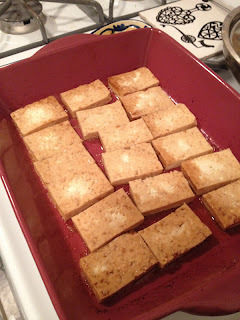 Then spray a baking dish with pam or olive oil, add the tofu and set aside while you make your sauce. 3. 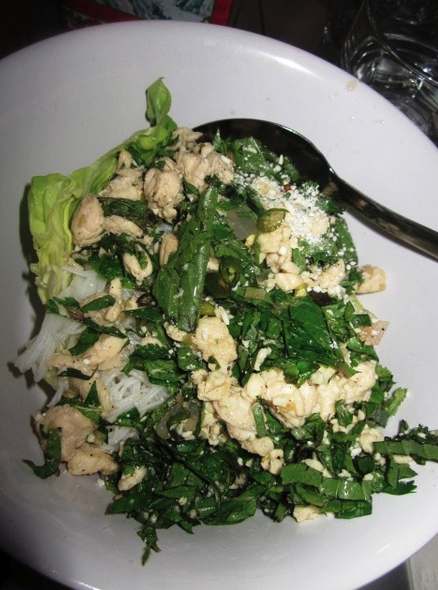 In a blender, blend together all of the ingredients on the list from the garlic down to the sesame oil. 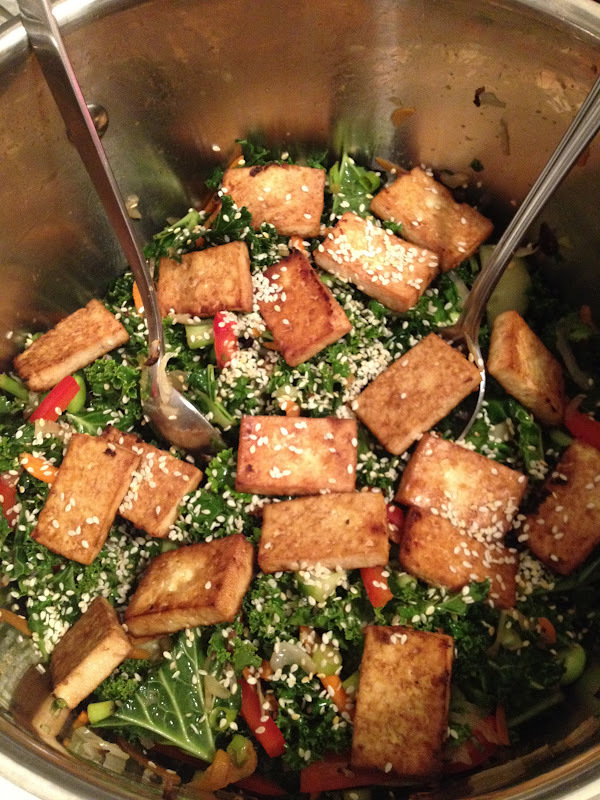 Take out about 1/4 cup of the mixture and pour over the top of the tofu. Try to flip the tofu over once or twice to get the sauce on all of the sides. Bake the tofu for about 30 minutes, making sure to turn the tofu over about 3 times during the baking process. 4. In a large bowl (you'll see I used a pot because I didn't have a big enough bowl), add all of the kale and pour the dressing over the top. Next you have to massage with your hands, making sure that the sauce gets all over all of the kale. This massaging process helps to wilt the kale. If you're not sure if it's massaged enough, try a bite and if it's still too tough for your liking, massage some more and hopefully it will wilt more. 5. I also sauteed the cabbage in a pan before adding it to the rest of the salad so that it wasn't as tough as it would be uncooked. The heat from the cabbage also can help to wilt the kale a bit. 5. Add the cucumbers, carrots, scallions, bell pepper, and edamame, along with the wilted cabbage to the kale. 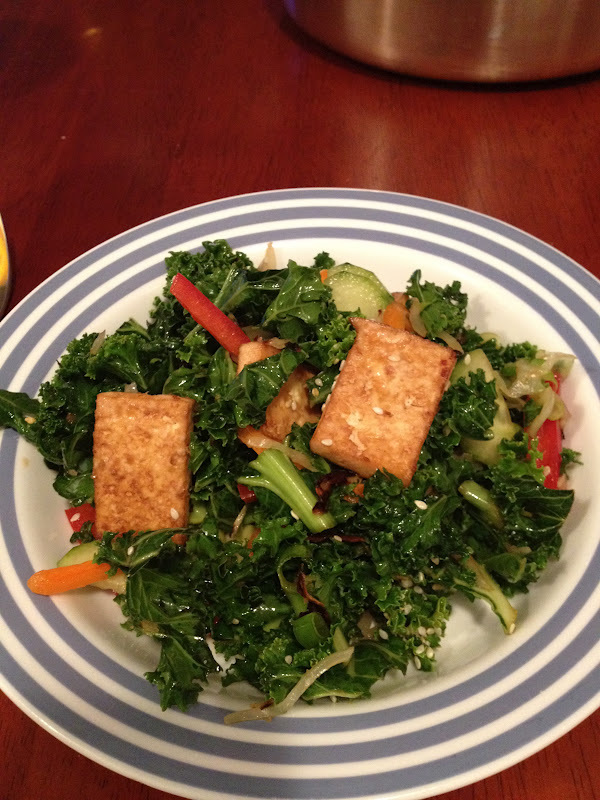 Toss to combine and add the baked tofu once you're ready to serve. 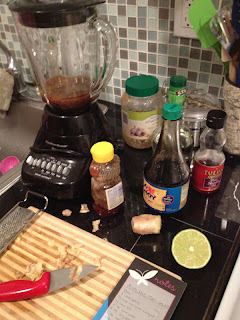 The last step is sprinkling lots of sesame seeds on top! I'd like to note that I didn't love this salad leftover, and the salad also wasn't quite wilted enough for me. I'm not sure if I needed more massaging, or if I'm just not that used to eating kale yet, but it was a little tough for me. 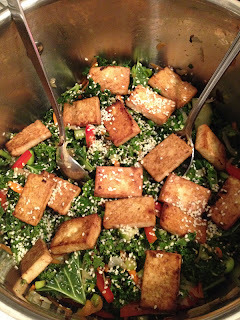 My favorite parts were the tofu and the sauce - which I could easily make again with different sides instead of the salad. Is Restaurant Week worth it?! This is the big question - it comes around twice a year, and inevitably I ask myself and my friends the same question every time. 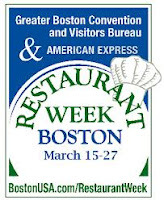 I'm still very torn but I would say that overall I've had more mediocre experiences than fantastic ones when it comes to Restaurant Week here in Boston. Maybe I'm just picking the wrong places? I've had a number of friends recommend that steak houses are the best places to get a great meal at a nice restaurant they wouldn't usually go to - but I wonder how much of that is coming from their boyfriends vs. them :-) .... This year I tried out two places with my girlfriends - one for lunch and one for dinner. Marliave was up first - my friends and I had perused a number of menus on the lookout for the best deal. The key to picking a good restaurant week menu is to find a high end restaurant that doesn't usually offer a pre-fixe deal on a slower night during the week. A lot of restaurants will offer the same deal as during restaurant week all year round, so those are the places to avoid in my mind. The other way to help decide where to go is to look at the actual restaurant week menus at particular restaurants. Because they offer just two or three options for each course, you want to make sure you'll actually be able to find something you like! This was how we came to pick Marliave - it seemed like a deal compared to usual prices, they had a really extensive menu with lots of options and the location was in the middle for everyone involved. I hadn't been here before - we were seated at their upper level dining room and it was very traditionally decorated. The lighting was quite dim so the pictures aren't great. I opted for the French Onion Soup as my starter - they call it 'Henry's Soup' - french onion, gruyere, short ribs and a crouton (usually $10). The other girls got a variety: Caprese Salad (usually $13), Macaroni and Cheese w/ black truffle (usually $14) and a cheese plate. They also brought a nice bread basket to the table with our drinks. It's sort of impossible for french onion soup to be light, but that's okay - it was good, not too salty and the addition of the short rib was a unique addition. Portions were pretty generous across the board. The main dish was much more difficult for me to pick out. There were almost too many options with everything ranging from Gnocchi or Risotto, to Chicken under a Brick or Beef Wellington. Scallops are something I like to order out because they're usually too expensive to just buy for myself and I don't really know too many ways to prepare them. Two of us ended up going with the Diver Scallops - jumbo scallops, wild mushrooms, pea ravioli (usually $28). I'm still getting used to funky mushrooms as I like to refer to them, so I didn't eat all of them and it was almost too mushroomy for me but I think my friend like that about the dish. I loved the pea ravioli and wanted a whole plate of just those! The other two ladies got the Wild Mushroom Risotto ($18) and the 'Sunday Gravy' ($19 - gnocchi, san marzano tomatoes, lamb, pork, beef. Even before dessert I think we all had gotten our money's worth out of the $33 deal! Dessert provided us with delicious options as well - I got their hot chocolate cake that came with ice cream and I was very happy with my selection, though I couldn't even finish it because I was so full from my earlier courses. I though the Box of Truffles was an interesting option they provided and I heard only good things from my friends about the trio of ice creams and the Butterscotch Pudding. Overall, what mattered more than the good deal and delicious food, was the lovely company! Thanks for a great evening girls! Harvest was up next - and with all of the high end restaurant options in the Cambridge area, this decision was a tough one. I found that a lot of the options didn't list their menus and that lack of options always makes me a little nervous to make a reservation there. I went here with an old coworker and they had both the lunch and light lunch options so you didn't have to get all 3 courses if you decided around dessert that you were full already. In our case, I wasn't quite full and would've gotten dessert but slow service caused us to have a super leisurely lunch and we ran out of time so 2 courses it was! To make it even easier, we both got the same two dishes for our starter and entree. The lunch was full of ups and downs. First, we were seated (not outside on the patio, but it wasn't the end of the world) and brought a lovely bread basket with a variety of options - like corn bread! But then we didn't have a server and we waited for more than ten minutes until I finally got someone's attention and told them no one had even asked us for our drink order. He profusely apologized and took our drink and food orders immediately - bringing our diet cokes right away. Unlike Marliave, Harvest had just 2 options in each category - though I had seen the menu in advance and liked the options enough to purposefully select this restaurant! Interestingly, none of their options are on their usual lunch menu. The zucchini fritters had caught my eye earlier so I stuck with my gut and ordered these as my starter. You could tell they were made to order and crunchy out of the fryer - yet they were nice and soft on the inside, and not super heavy surprisingly. I wish it had come with a small side of greens, but then again - it was a starter, not an entree. For our entrees we both selected the chicken lasagna, another item not typically on their lunch menu. I could've eaten another slice of this - it was delicious, full of flavor, not super heavy like a lot of lasagnas and we both commented on how our lasagna's don't come out like theirs did! After craving a little salad with my starter I was pleasantly surprised to see a side of mixed greens with the lasagna. I didn't have the time to try out dessert, but from what I observed of the many dishes going past our table, they looked just as delicious as our other courses! So what are your thoughts? Yay or nay to restaurant week? I think it's a bit like cilantro - people either love it or hate, there's not much gray space in between.